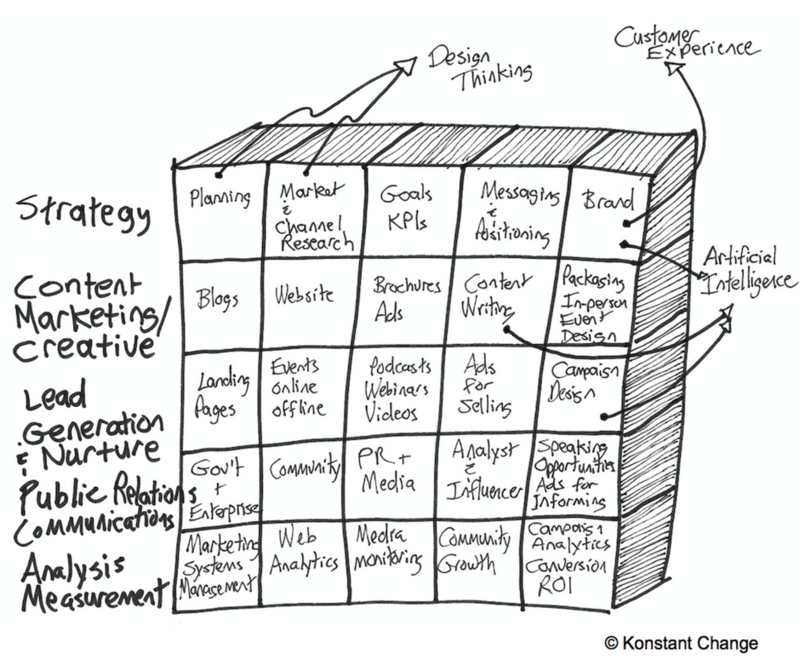 The marketing landscape is changing. Adapt or get left behind. The professional marketing work environment is changing rapidly. The half-life of our well-earned education is shrinking so fast it’s fading like the last gasp of summer. Exponential growth in technology and our fluid work environments require corresponding responses, based on intentional actions, rather than scattered reactions. Savvy agile workers who adapt to dynamic circumstances will thrive. Stubborn individuals who ignore the flashing neon signs of change will be left behind. The methodical accumulation and creative application of knowledge are reasonable responses by astute marketers who embrace learning as a lifelong journey. Incremental education, certificate coursework, bootcamps or upskilling in the form of personal curated learning experiences ensures career relevance. You can recalibrate skills or satiate hunger for side interests and hobbies. No-cost education like Massive Open Online Courses (MOOCs) and low-cost online training through Coursera or Udemy are readily available. Fundamental skills become outdated at a much quicker velocity than past decades. Salim Ismail, author, investor, entrepreneur and recent executive director of Singularity University, has studied this vanishing act. He assesses the half-life of knowledge has moved from thirty years to five years in the span of one generation. This creates a compelling justification for commitment to lifelong learning. College degrees and training are a baseline for startup careerists. Like software updates frequently delivered to our devices for critical revisions, individuals will benefit from updating their personal learning systems. The well-trained individual with the latest skills will forge her way to the promotion path. Meanwhile, the half-life calculation beats the drum of declining skills and potential loss of employment. Conventional employment titles and occupations are drifting from view, making way for roles responding to the demands of new marketing solutions and strategies. To demonstrate this, let’s review a diagram of titles and roles within the digital marketing orbit. The following diagram of marketing functions includes strategy, content marketing, lead generation, public relations/communications and measurement. Within those functions are key specialties like market research, brand management, content creation and campaign analytics. “How do I stay in the game,” you ask? Future-proofing a career lies in the mash-up of trends and industry change within the current state of marketing. For example, the trends of design thinking, customer experience and artificial intelligence, will form new pathways for tomorrow’s marketing specialties. Other industry developments, like big data and marketing technology paired up to invent new occupations. The promised land of career abundance lies in the job descriptions not yet invented. The best job insurance is to discover market and employment gaps you can fulfill in a unique manner. Andy Crestodina, cofounder of Orbit Media Studios, started his career as a technical recruiter and quickly found his calling in web development. Since then he has held numerous roles, building on knowledge and interests of previous jobs: web strategist, business development, content strategy, search engine optimization, social media, analytics, speaker and author. As a top influencer and marketing expert, he is a student of change who studies the trends and takes action. Responding to change is a bold move. It can be scary, yet it can be an exhilarating experience. While all responses to change do not have to be grand gestures, as in looking the dragon between the eyes, you can start with deliberate thoughtful actions. The theatre of our life’s work is flush with opportunities to respond. There is satisfaction when trends are identified in preparation for making a positive move in your life’s work. How about you? Do you have an upskilling or “respond to change” success story? We are actively looking for feature interviews and stories for this blog.